Amazon.com description: Product Description: The most prominent Web applications in use today are data-intensive. Scores of database management systems across the Internet access and maintain large amounts of structured data for e-commerce, on-line trading, banking, digital libraries, and other high-volume sites. Developing and maintaining these data-intensive applications is an especially complex, multi-disciplinary activity, requiring all the tools and techniques that software engineering can provide. This book represents a breakthrough for Web application developers. Using hundreds of illustrations and an elegant intuitive modeling language, the authorsâall internationally-known database researchersâpresent a methodology that fully exploits the conceptual modeling approach of software engineering, from idea to application. 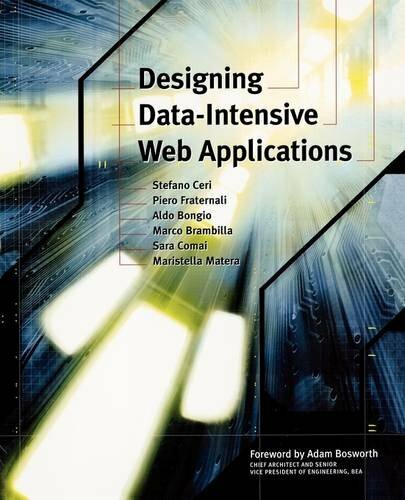 Readers will learn not only how to harness the design technologies of relational databases for use on the Web, but also how to transform their conceptual designs of data-intensive Web applications into effective software components. * A fully self-contained introduction and practitioner's guide suitable for both technical and non-technical members of staff, as well as students. * A methodology, development process, and notation (WebML) based on common practice but optimized for the unique challenges of high-volume Web applications. * Completely platform- and product-independent; even the use of WebML is optional. * Based on well-known industry standards such as UML and the Entity Relationship Model. * Enhanced by its own Web site (http://www.webml.org), containing additional examples, papers, teaching materials, developers' resources, and exercises with solutions. About: The most prominent Web applications in use today are data-intensive.